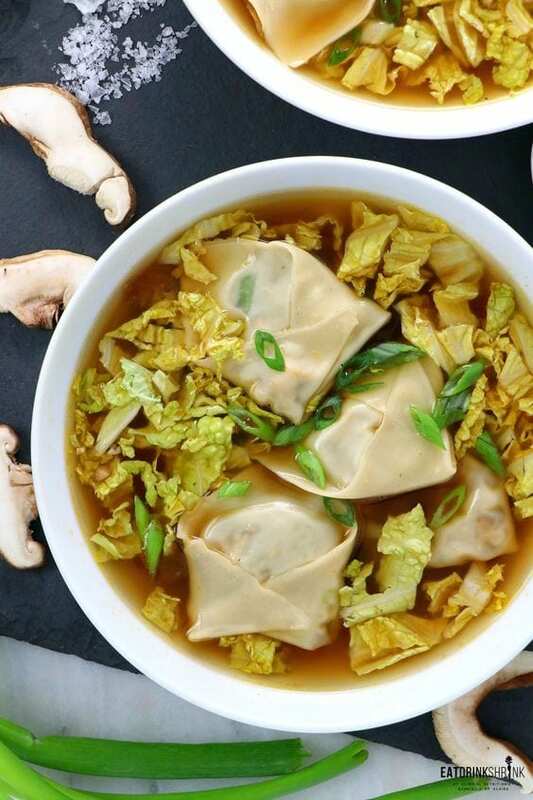 Vegan Shiitake Wonton Soup - Eat. Drink. Shrink. For a long time I never pursued wonton type concepts. However, once I found a market that offered vegan wontons, I was off creating a variety of recipes. 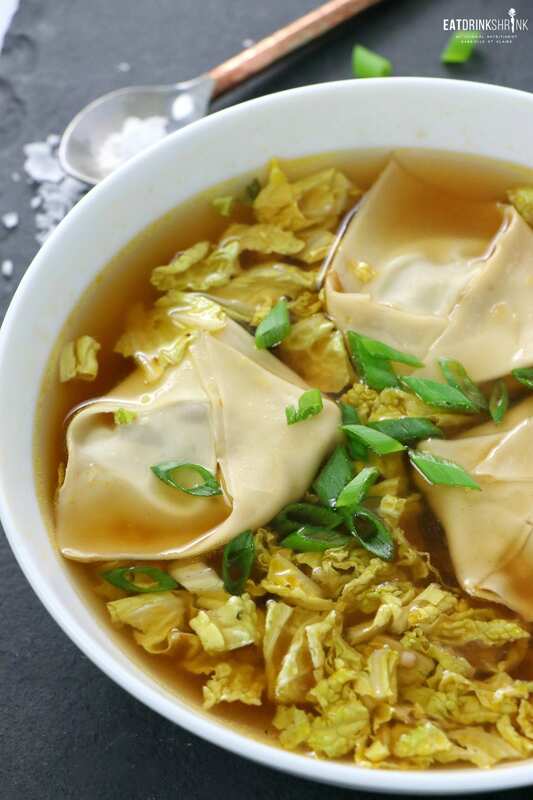 One of the few concepts I never did was a vegan wonton soup! The texture becomes like that of pasta and they pack tons of flavor that permeate the soup. 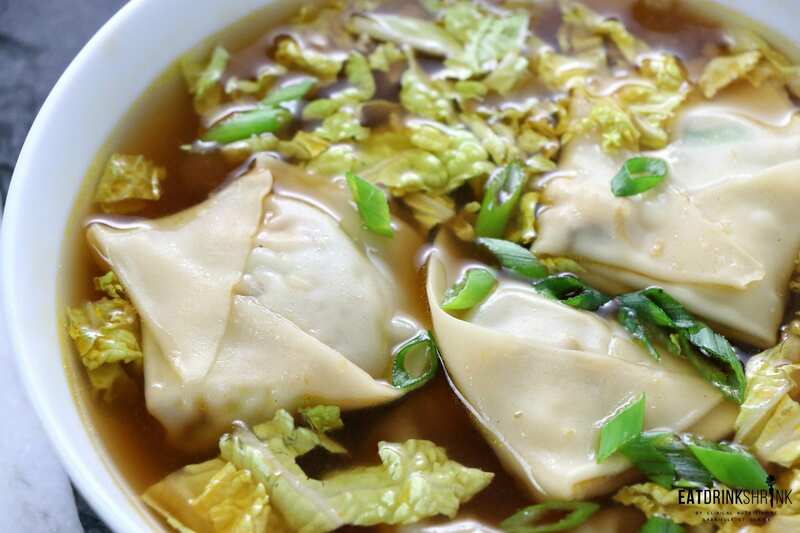 There is just something fun about a wonton soup and surpassingly, it’s really easy to throw together. The first few times you work with wonton wrappers you may find they give you a headache as they dry out easily, rip easily, but it just takes practice..
and at the end of the day, the wontons don’t have to look like perfection! What’s fab about this soup, is everything! It’s quick and easy, features staple ingredients minus the wontons and rice wine, affordable, it packs flavor, packs veggies, has texture, can easily be made in bulk, perf for any season, and will make you look like an iron chef next time you’re entertaining! 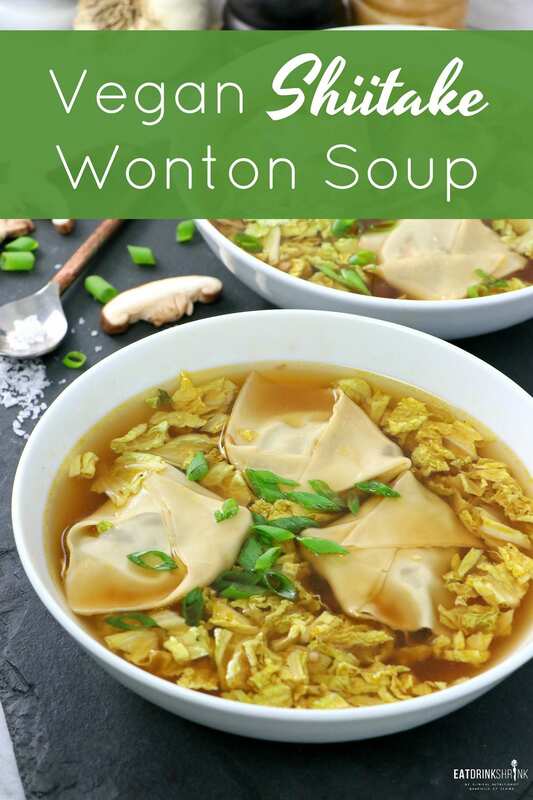 If you love quick and easy vegan staples, you’re going to love this vegan Shiitake Wonton Soup!! 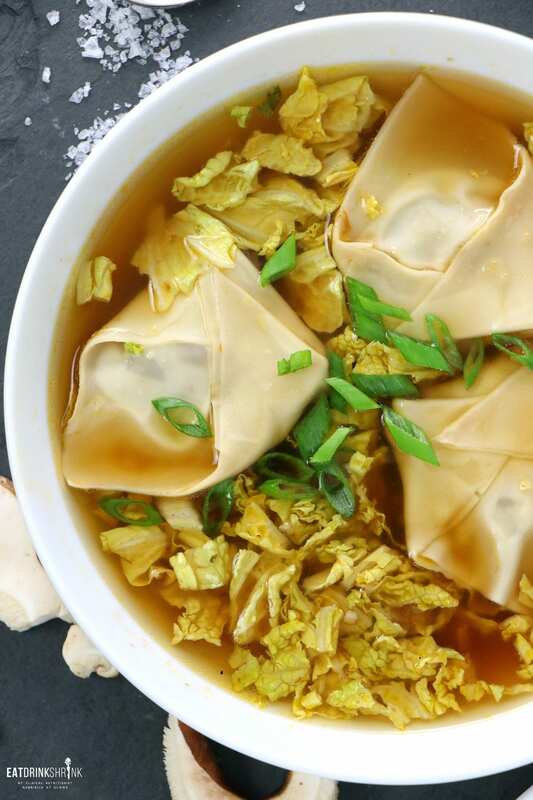 For the wontons: Combine all the filling ingredients in a small bowl. 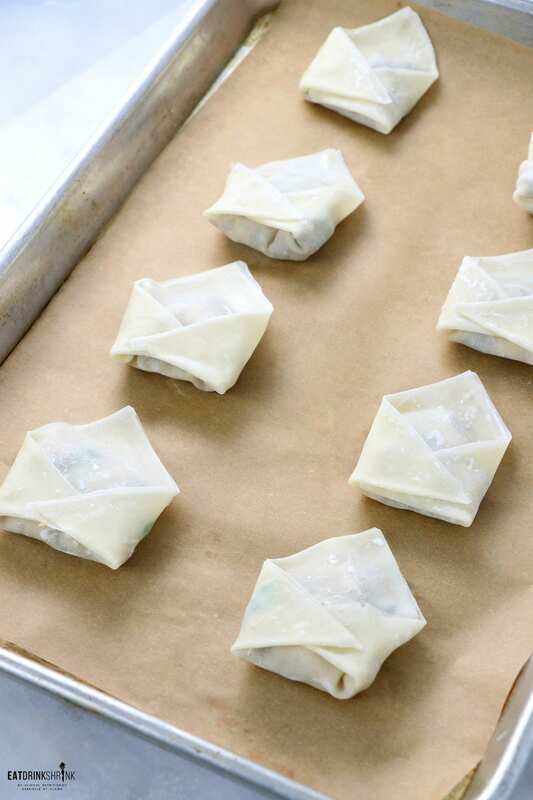 Take one wonton wrapper and lay it out in a diamond shape in front of you. 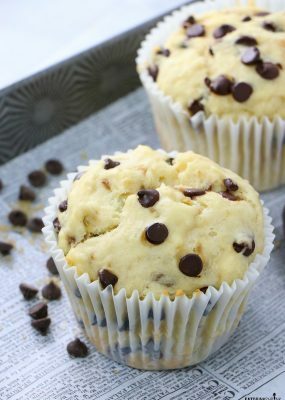 Place 1 teaspoon of the filling in the middle of the wrapper, dip your finger in a little water and moisten the top two edges of the wrapper. Fold the bottom corner up to meet the top corner, making a triangle. Gently press down on the filling to squeeze out the air, then press the edges together to seal. 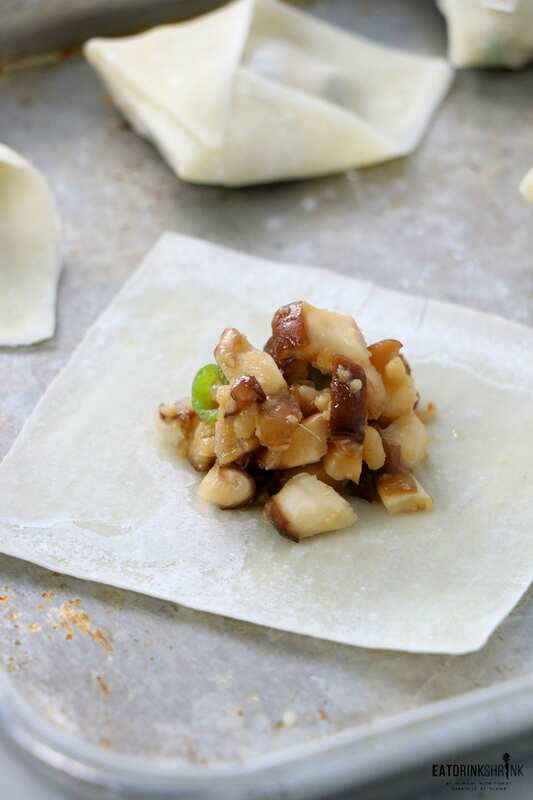 Take the left and right sides of the triangle and pull them down and towards each other, making a loop at the bottom of the wonton. Moisten the edges and press to seal. For the wonton soup: In a pot over medium heat add the oil, garlic and ginger. Cook for 2-3 minutes. Add the vegetable stock bring to a boil. Add the wontons and reduce the heat to a simmer. Simmer until the wontons float, about 5 minutes. Remove from heat and stir in the rice vinegar, soy sauce, and shredded cabbage. Serve in bowls garnished with green onion.